The Trump administration has reversed course on Syria again, blaming President Bashar Assad for the alleged chemical attack in Idlib province and declaring he has no future leading Syria – just days after publicly abandoning the policy of regime change. 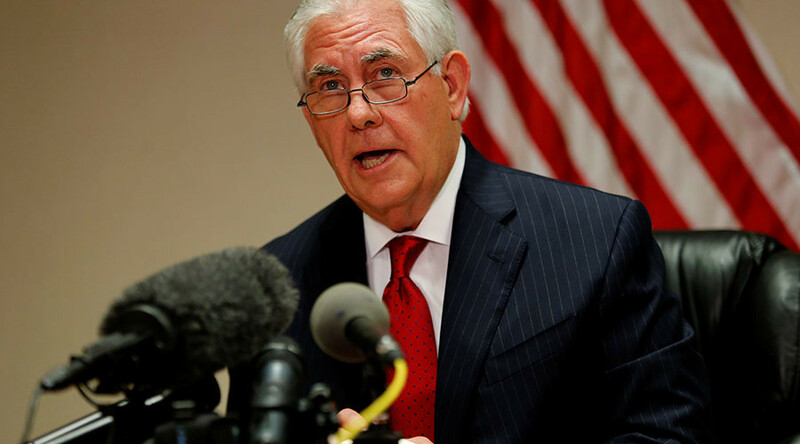 “There is no doubt in our minds, and the information we have supports, that the Syrian regime under the leadership of Bashar al-Assad are responsible for this attack,” Tillerson told reporters in Florida, ahead of the summit with Chinese President Xi Jinping. “It is very important that the Russian government consider carefully their support for Bashar al-Assad.” Tillerson added. Just last week, Tillerson was telling reporters that Assad’s fate is something to be “decided by the Syrian people,” drawing criticism from the US foreign policy establishment. Under former President Barack Obama, the US has maintained that “Assad must go” was a precondition for peace in Syria, ravaged by civil war since 2011. The abrupt change comes after the allegations that the Syrian air force used chemical weapons against civilians in Idlib province, heavily publicized by Al-Qaeda-affiliated White Helmets rescue group. “I think what happened in Syria is a disgrace to humanity,” US President Donald Trump told reporters aboard Air Force One on the way to Florida. “He’s there, and I guess he’s running things, so something should happen," he added. Damascus has denied using chemical weapons, saying that its jets targeted an arms depot where chemical weapons stockpiles were stored by Islamic State (IS, formerly ISIS/ISIL) and Al-Nusra Front militants. The Russian Ministry of Defense has confirmed that account of events. The Pentagon is developing options for a military strike in Syria, unnamed government officials told the New York Times on Thursday. A planned US attack was aborted in 2013, after Russia negotiated the Syrian surrender of all chemical weapons stockpiles. The US priorities in Syria would be defeating IS and stabilizing the liberated territories, followed by working with international partners on a “political process that would lead to Assad leaving,” Tillerson said. The chemical attack is a “serious matter and requires a serious response,” he added.